Our photograph today shows a Karrier double-decker bus which was operated by the Galway General Omnibus Company. It was taken at the Spring Show in the RDS in 1924, before it went into revenue earning service. The side panel carries the name of the company, but not the crest. The small lettering on the chassis below the word ‘Galway’ reads ’12 m.p.h.’ A major problem with this type of vehicle was its chain drive which frequently slipped off and caused breakdowns. The bus had solid-tyred wheels and was uncomfortable to ride in. 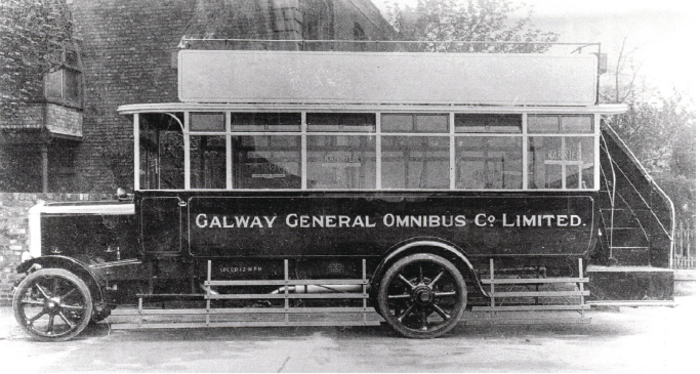 The demise of the trams in Galway created the space for a new motor omnibus service. The GGOCL was registered as a public company in April 1919. The directors were Thomas McDonagh, Joe Young, Robert Mackie, Michael J Crowley, Philip O’Gorman, Martin Hynes, and Martin Finan. The manager was Joseph Garvey and the secretary was John M Leech. The registered office and garage were at Victoria Place. The garage consisted of a rectangular shed with two annexes. It had a galvanised roof and room for 10 standard size buses. The entrance from Victoria Place was through folding sliding doors. The stated object of operation was a bus service of 15 minutes frequency between Galway and Salthill, and at 10 minute intervals during the summer. There were no bus stops, one simply raised one’s hand and the bus stopped. It always stopped at Nile Lodge, the half way point. The GGOCL had problems in 1921 when the RIC Auxiliaries commandeered two buses, mounted machine guns on board, and drove them away. They were never seen again in Galway and the company had to borrow funds to replace them. In July of that year, two more buses were commandeered for the purpose of removing patients from the Galway Workhouse to permit occupancy of the building by the military. Seventeen men and 43 women were forcibly removed amid great protestations. These aged and infirm people were taken to Gort Workhouse. During the Civil War, another bus was taken by the Free State Army and never returned. Excursions were organised to places like Ballyvaughan, Ballinrobe, Knock Shrine, and on one occasion three buses took 80 poor children and members of the St Vincent De Paul on a day trip to Lough Cutra near Gort. During the year 1934, the company’s vehicles completed 39,786 journeys between Galway and Salthill and carried 476,033 passengers. In 1935, it launched new routes to connect the city with some new housing developments such as Taylor’s Hill and Newcastle. By now, almost all private bus operators in the country had been taken over by Great Southern Railways or Great Northern Railways, either voluntarily or by compulsion. On August 8 1936, the services of GGOCL, its licences about to expire, were taken over by Great Southern Railways. All of the above is taken from a new book entitled The Story of the Galway General Omnibus Company Limited compiled by Michael J Hurley. It is very well researched, informative, and has a lot of illustrations. Highly recommended. Available from good bookshops or [email protected] . Tonight (Thursday ) at 8pm, the Old Galway Society lecture takes place in the Victoria Hotel. The title is “New Insights into the Pilgrimage Traditions of Caher and St McDara’s Islands” and it will be given by Michael Gibbons. All are welcome. On Monday next, February 16, The Galway Archaeological and Historical Society will host a lecture by Dr Gerard Moran entitled “The Benevolence of a Quaker, James Hack Tuke and the West of Ireland” in the Harbour Hotel at 8pm. All are welcome. An Taisce will host a lecture by Peadar O’Dowd in The Ardilaun on Wednesday next, February 18, at 8pm. The title is “The Supernatural, a Long History in County Galway” and all are welcome.